How can a hole in your pocket cause a hole in your gums? The answer is stress. Financial stress affects more than your wallet: It can have a ripple effect on your health and interpersonal relationships. Prolonged stress increases your chances of heart attack, diabetes, hair loss, depression -- and gum disease. 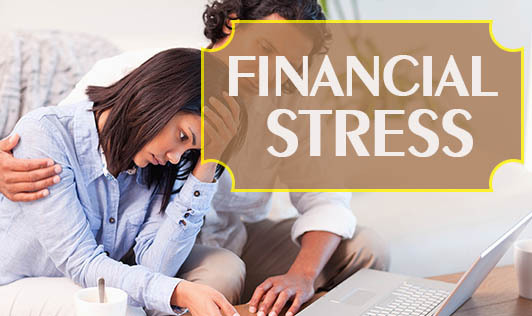 OK, so hearing that stress can make matters worse isn't exactly soothing, but the good news is that time and deliberate action can simultaneously improve your financial situation and release you from the grip of stress. Below are some of the ways you can use to start eliminating some of the mental obstacles that keep you financially stressed out. 1. Narrow your Choices: It's all too easy to allow fear of making a bad choice keep you from making any choice at all. Maybe you have a finite amount of money to invest, or you're stressing about making a big purchase, or you can't make up your mind which is more important college savings for the kids or retirement savings for you. If you find yourself at your desk with your hair in knots, remember this: You don't have to make the "right" choice. You don't have to make the "final" choice. You simply have to make a choice, the choice to act. 2. Ditch your Defeatist Attitude: If fear of making the wrong choices about your finances has left you mired in indecision, imagine how people who think they have no choice at all must feel. In many cases, people don't save, not because they actually couldn't, but because they believed they couldn't. The trick to ditching your defeatist attitude is finding a way to believe that somehow, even in the most untenable of circumstances, there is hope. Simple things like making a gratitude list or visualizing yourself free of financial stress can also help you feel more hopeful. 3. Stop Rowing in Circles: When it comes to finances, picture your household as a boat. If you're on your own, you'll need to pull your own weight to get to where you want to go. If you have a family to support, your journey can be easier or much, much harder depending on whether or not your oarsmen are rowing together. Even in relationships where couples are basically on the same financial page, differences in priorities can set the boat spinning in circles. To move the boat forward, partners must learn to communicate and row together. 4. Make a Budget and Stick to It: There are four basics to revamping your financial life. These include sticking to a budget, cutting expenses, reducing debt, and saving. Budgeting isn't rocket science. In the simplest terms, you put your income at the top of the page, and from that number, you deduct your expenses. The amount left over is what you can spend on other things, such as reducing debt and increasing savings. Having a written budget gives you confidence in your personal financial strategy, which can help you dramatically lower your financial stress level. There are literally hundreds of apps and tools you can use to create a budget -- from good old pen and paper to phone apps and desktop solutions. 5. Cut Expenses: When your budget shows you that you have more month than money, the solution is to cut expenses. Divide up the grocery list and have the family split up to see who can find the biggest bargain. With a little ingenuity and a hopeful attitude, you can and will successfully cut your expenses, leaving you with more money at the end of the month to devote to other financial planning basics. 6. Get Rid of Debt: While debt elimination, retirement, and emergency savings are all essential to eliminating financial stress, getting rid of debt should be your number one priority. Certain kinds of debt (mortgages, student loans, etc.) are eventually unavoidable. The only solution is to pay it off as quickly as possible. You can try options such as consolidating credit card balances onto the lowest-interest card possible or always paying more than the minimum balance. If you are paying off more than one card, always pay the maximum amount possible on the card with the highest interest rate. Once you've tackled your debt, you should find yourself, finally, with extra money at the end of the month. 7. Surf the Net and Save: There are many websites that provide free cost-comparison search engines that save you money. You input information about how much you're spending for petrol/diesel, cell phone bills, television service, credit cards, utilities, insurance, and a host of other consumables, and these sites spit out alternatives that can save you money. These sites help to eliminate the stress that arises out of cost-comparison shopping by doing most of the time-consuming research for you. Knowing you're saving money will give you confidence about the purchases you're making.